Washington (CNN) – Hillary Clinton has had an up and down week since her memoir "Hard Choices" hit bookshelves Tuesday. She's been personally called out, her words have been dissected and she has been criticized for what is - and is not - in the book. But on Friday, sitting across from a close friend and longtime aide, Clinton told an audience of 1,500 people in Washington, that the process "feels a little bit liberating, to be honest." "It just seemed a whole lot easier to just put it out there and hope people get used to it," Clinton said after Lissa Muscatine, her former speechwriter and communications director, asked her about the first week of the book tour. "Whether you agree with it or not you know exactly where I come from, what I think, what I feel." Clinton's book has received mixed reviews. While some have been positive, calling it a compelling look into diplomacy and statecraft, many have called it news-less and boring. She called the process of writing the book "a terrific" one, but noted that "some days were off-the-charts wonderful and some days were not-even-on-the-charts terrible." 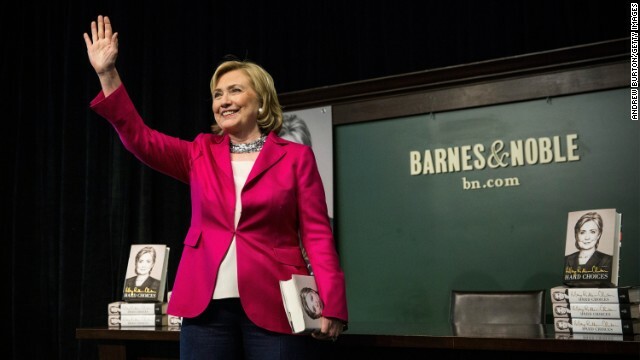 Since the book hits stores on Tuesday, Clinton - who is widely considered the frontrunner for the Democrat's 2016 presidential nomination - has appeared at four events in New York, two in Chicago, one in Philadelphia and one in Washington. In the coming week she will visit northern Virginia, Canada, Seattle, Los Angeles and Texas. The atmosphere of the tour has been part campaign, part sales job. Clinton and her aides have been followed by a pro-Clinton bus (chock full of Clinton devotees), a Republican National Committee staffer in an orange squirrel suit, and a cacophony of talking heads, pundits and opinionators. Clinton herself has used the events to highlight parts of her book and talk about certain chapters in the 600-plus-page tome (she said Friday that the first manuscript ran at three times that length). Outside each event, organizers come prepared to sell thousands of copies, most of which are signed with a simple "Hillary." And in her comments about the book tour on Friday, Clinton argued that the entire process has been a freeing one, allowing her to be "totally done with, you know, being really careful about what to say because somebody might think this instead of that it just gets too exhausting and frustrating." While true at times - Clinton has been unvarnished to some audiences - she has also carefully walked back inopportune statements she has made in interviews around the book. After Clinton told ABC's Diane Sawyer that she and her husband were "dead broke" and in debt when the left the White House in 2001 earlier this week - a comment that was widely panned considering their earning potential, book advances and government salary - the former first lady walked back the refrain at a Wednesday event. "That may have not been the most artful way of saying that you know Bill and I have gone through a lot of different phases in your lives," Clinton told Chicago Mayor Rahm Emanuel in a public interview. "That was then, this is now." She later added that her family has "been blessed," but noted that they have also "gone through ups and downs like a lot of people." After she was criticized for her response to a question about her record at the State Department, Clinton also gave a more succinct answer on Wednesday. "Well the biggest accomplishment in the four years as secretary of state was helping to restore American leadership, and we did that in a number of ways," Clinton said, before enumerating a long list of achievements and diplomatic moves she made during her four-year tenure. The former secretary of state did something similar on Friday. At the same time that she recalibrated statements, Clinton also did appear more loose and free than in past months. She let out loud laughs during light moments with friends and told stories from her childhood. Describing her process of whether to take French at Wellesley College, Clinton said one French teacher discouraged her because a lack of skill. "Mademoiselle, your talent lie elsewhere," said Clinton – adapting a French accent to mimic the professor. Clinton, who rarely shook hands with people after speeches during campaigns and while in office, even worked the front of the stage on Friday. As a crush of students and other ticket-holders moved to the front of the auditorium to shake Clinton's hand or get a better picture, the former first lady took in the adoration by posing in selfies, laughing at remarks and even, at one point, holding a baby with a big smile. I don't believe for one second that Hillary Clinton wrote this book herself. She needs to go do some yoga and get a deep massage . After her uptight interview on NPR , Hillary needs to realize she is not as well skilled as the 'Iron Lady' Margaret Thatcher . That's not so. I volunteered for her 2008 campaign. Hillary, whenever she had time between events, would shake hands and pose for pics. She would also sign books, posters and whatever else people brought for her to sign. This lady is clearly not ready to lead the free world. She should stay home and enjoy her grand child. After the book tour Hillary needs to rest for the big camping trail and election in 2016.
what would a day be without 2-3 hillary clinton puff pieces trying to make the cold calculated political machine look human. we will never know, right cnn? For the love of God!! Please liberate ME from this endless stream of Hillary Clinton stories on the Ticker!! How much is she paying for all of this CNN publicity??!! The lying and deceptions, tour............to be repeated numerous times. She'll say anything to get elected, if you can't see that, you are delusional. I'd vote for her over todays republican dummy . Hillary think you need baby sitter. She right. you do need baby sitter! So get in you jammies and partake of Hillary's wisdom! And just think, with Hillary as your official Baby Sitter, you get 2 for the price of one! Bill lurking in background just out of sight! The last thing this country needs is another lying, coniving Democrat in the White House. After 8 years of Obama lies, deceit and incompetence, the country is ready for some REAL leadership, a REAL leader, not some teleprompter reader that you know is never telling the truth, ie. Hillary Clinton. Hillary Clinton has more baggage than the Queen of Sheba, but none of the charms! She used to pull these media jaunts off well, with her "victim" act, but now, after working for -and covering up for Obama's inept decisions, plus Benghazi and her finances, she Blew It! the truth intrudes(liberal NPR reporter over her "gay marriage" evolution). She has Lost it! Age and arrogance! Not pretty-to Voters! Way half her age-and fed up with Obama, her boss. need of home care soon! Vegan diets look like death warmed over on newbies-like him. Too, late! As with The Book! So who do u morons think should be president then? Ad please don't say a Republican/Teapartyer or corporate Dem- those people are not about what's right for the country. To the haters. Get used to Hillary and stories about her as she becomes our next president. I love to hear your heads literally explode. You are used to the little uneducated women of your party. See screecher from AK and the flake from MN for starters. Angle anyone? Christine the witch? Rodgers whose star blew out before the heat was felt. The one from NH who stands behind her men and when she speaks she sounds like one of their parrot?